In May of 1487, for unknown reasons, Dowager Queen Elizabeth Woodville, the widow of King Edward IV, was compelled to give up all of her lands and possessions and retire to Bermondsey Abbey beside Southwark. It was a surprising move on the part of King Henry VII and his council and the motives for her retirement have been argued by historians ever since. Whether it was voluntary or involuntary on her part is unknown. It could be as simple as Henry wanted her lands and income for his wife, Elizabeth of York who was the dowager queens’ eldest daughter and had recently given birth to a male heir, Prince Arthur Tudor. Some historians think Elizabeth may have had involvement in the recent rebellion to place the pretender Lambert Simnel on the throne of England. “In Dei nomine, Amen. The Xth day of April, the year of our Lord God M cccc LXXXXII. I Elizabeth by the grace of God Queen of England, late wife to the most victorious Prince of blessed memory Edward the Fourth, being of whole mind, seeing the world so transitory and no creature certain when they shall depart from hence, having Almighty God fresh in mind, in whom is all mercy and grace, bequeath my soul into his hands, beseeching him, of the same mercy, to accept it graciously, and our blessed Lady Queen of comfort, and all the holy company of heaven, to be good means for me. I’tm, I bequeath my body to be buried with the body of my Lord at Windsor, according to the will of my said Lord and mine, without pomp entering or costly expenses done thereabout. I’tm, where I have no worldly goods to do the Queen’s Grace, my dearest daughter, a pleaser with, neither to reward any of my children, according to my heart and mind, I beseech Almighty God to bless her grace, with all her noble issue, and with as good heart and mind as is to me possible, I give her Grace my blessing, and all the forsaid my children. I’tm, I will that such small stuff and goods that I have to be disposed truly in the contentac’on (settling) of my debts and for the health of my soul, as far as they will extend. I’tm, if any of my blood will of my said stuff or goods to me pertaining, I will that they have the preferment before any other. It was a simple will and demonstrates she didn’t have anything of great value to leave her children. She only mentions her daughter Queen Elizabeth of York and her son by her first marriage, the Marques of Dorset. Elizabeth died on June 8, 1492. 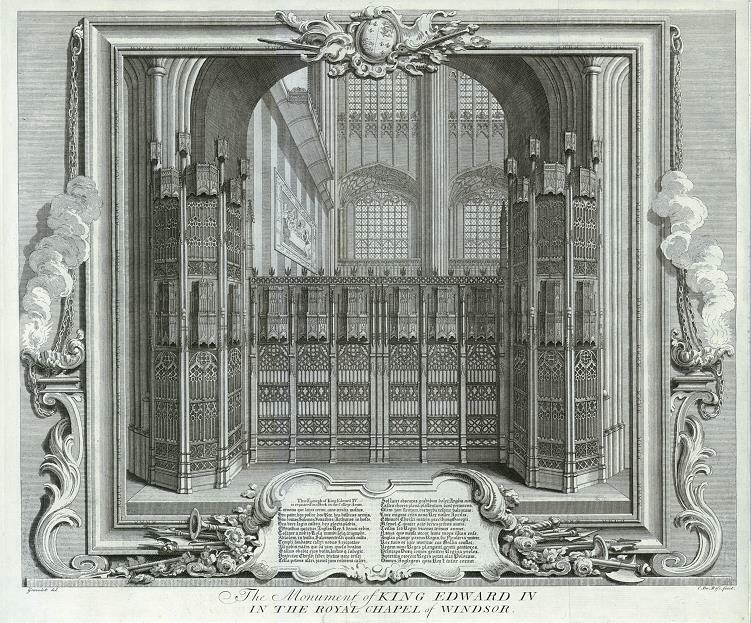 On June 10, her body was put in a wooden coffin on a low, unadorned hearse and taken by boat to Windsor, accompanied by Prior Ingilby, Dr. Brent, her second cousin Edward Haute, and two gentlewomen, one of them being King Edward IV’s natural daughter Grace. The coffin was taken quietly from the river to Windsor Castle and was received there at eleven o’clock at night by a single priest and a clerk and buried immediately. Two days later, the Marques of Dorset, his half-sisters Anne, Catherine and Bridget, Edmund de la Pole and a handful of other relatives arrived at Windsor. That evening the Bishop of Rochester performed the dirige and requiem mass. One of the heralds at Windsor mentioned there were only four wooden candlesticks around the coffin. He also said there were no new torches in the procession but just several old men holding old torches and torch ends. It wasn’t unusual for someone of her status to request a simple funeral and burial and she may have known her estate was impoverished and unable to afford anything more elaborate. However, tradition required a person be buried according to their rank and estate. This funeral must have been a sad sight and not worthy of a former Queen of England. for some reason i’ve always liked Elizabeth Woodville. Great article. I love reading about British royal history. Interesting story. I am not a fan of Elizabeth Woodville, but I do like reading about her and other personalities from this time period. Many historians keep referring to the Woodvilles as a rapacious bunch. I’m not so sure. They had a very large family and they did what every other noble family did, which is marry for advantage and dynastic considerations. I will say however, that despite his flaws, Edward 4 is my favorite British King. How the high and mighty had fallen, a fitting end to a medlesome woman. Henry Tudor was obsessed with accumulating wealth, by any means; usually by extortion. I doubt very much that the gutsy Elizabeth would have simply “retired” without a huge shove from Henry. £400 was a decent amount in the late 15th century. Elizabeth Woodville”s last years then should not have been financially precarious. I have often figured that if the retirement was involuntary, she may simply have ticked Henry VII. Family disputes can be a bit riskier if one of the parties is the king. She may have retired voluntarily. Three of her children (Richard Grey, Edward V, Richard of York), two brothers, and her father, had died by violence; her oldest daughter was now Queen, her grandson heir apparent. Her death 5 years after leaving court may indicate poor health (or it may not). Maybe she was simply tired, perhaps even sick of it all. I don’t buy the theory of involvement in the Lambert plot. As far as I know, that idea originated with Francis Bacon in the 1620s. I agree with you Richard. I think it might have been voluntary and that she wasn’t involved in the Simnel plot. I have read that Elizabeth’s surviving Grey son might have been involved in the Simnel plot. A great post.A lot of people always wondered who Grace was,and didn’t know that she was the late King’s daughter. Also that his daughter Bridget who by this time was in a nunnery, actually left it for the only time in her life to attend her mother’s funeral .It is good to see them mentioned. I haven’t heard of his daughter Grace, who was her mother? No one knows who her mother was. I enjoy reading your articles on British history. This one was particularly interesting – what a sad ending for a very interesting woman. I enjoyed reading your article. I can understand the quick burial as she had been dead for 3 days in warm weather. Her funeral seems like a memorial service with such a small group of people attending. For someone who was at the center of events for so long, it seems anticlimactic.